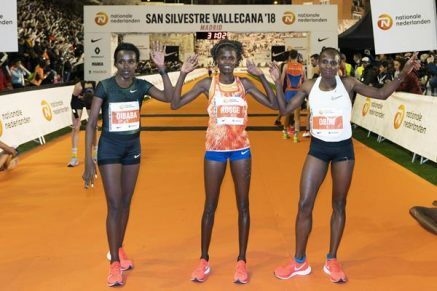 31st December 2018 – World 5000m champion Hellen Obiri (KEN) made a very impressive debut over 10k at the San Silvestre Vallecana in Madrid. The traditional New Years Eve race is one of the highlights of the Spanish calendar and it always delivers a high-quality event. This year was no exception with Hellen facing among others three times Olympic Champion Tirunesh Dibaba and recent Chicago Marathon winner Brigid Kosgei. The first three kilometres were covered in well under nine minutes which saw Kosgei and Hellen ahead of Dibaba. The Kenyan duo continued to push and after passing halfway in 14:40 it was clear it was a race between the two. Kosgei was the one keeping the tempo high as Hellen held on hoping to use her superior track speed towards the end. Finally, within the final kilometre Hellen’s resistance was broken but she still crossed the line second in a superb 29:59, just five seconds behind the winner. Although the course is not eligible for record purposes it shows that Hellen is already in great shape heading into 2019 where she will look to contest the World Cross Country Championships before defending her world 5000m title in Doha.